Don’t make your patio too small. 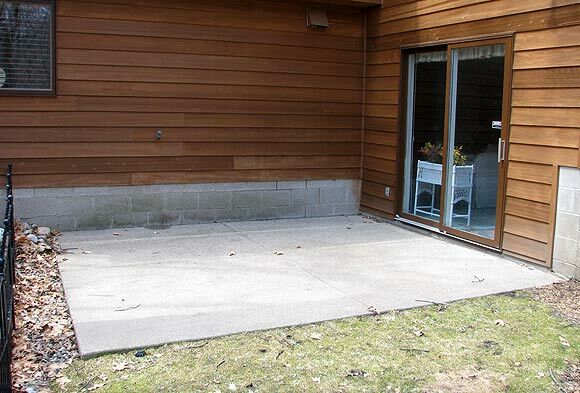 Or purchase a home where the builder decided that a 10’ x 12’, poured concrete patio was just the thing you’re looking for. If you love the house, buy it with the realization that the dinky patio has to be ripped out, and a real patio built in its place. The absolute smallest size I think practical for a patio is 240 square feet, double the size of the absolutely useless patio pictured above. 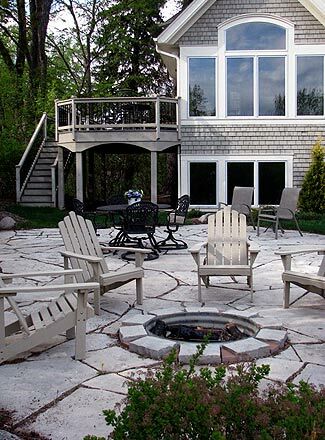 If all you want on the patio is a nice, glass-topped round patio table (with umbrella) that seats four, plus room for the grill and a few decorative containers, you need at least 240 square feet, preferably not configured as a straight-line square or rectangle. Patios should always curve. Think putting greens. 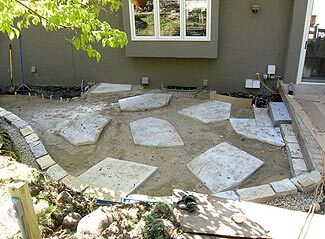 Early construction stage of one of the smallest patios I’ve ever built, about 15’ x 16’. You’ll start using a patio, to sit with a laptop, pay bills, watch and enjoy your garden, drink an afternoon beverage or just relax with the spouse. So you’ll want an area to sit and relax that isn’t the patio table, typically a few comfortable chairs with a small side table. Maybe you want a nice chaise lounge for tanning, or reading. You’ll need space for containers to brighten up the area. If you have a large family or like to entertain, a larger patio table that seats eight or ten is required. Measure a nice patio table before you buy it, then remember that the patio has to be large enough that people can push their chairs away from the table as they enter and exit. Now you need a patio in the 350 square-foot range, with a width in there somewhere of at least 16 feet. Fire pit, patio table, side seating, these things require ample space. Grill smoke is always a concern. Your patio has to be large enough that smoke doesn’t waft around family or guests seated at the patio table conversing while they wait for the food. And large enough that you have space to place your grill downwind from the patio table, based on the most common direction of the wind. And when in doubt, go even bigger than you think.